I'm going to guess that you are aware that Easter comes a bit early this year. I'm in the process of changing out my decor from Valentine's Day to Spring/Easter…and by being in the process, I mean my husband got the boxes out of the attic and they are sitting around waiting for me. 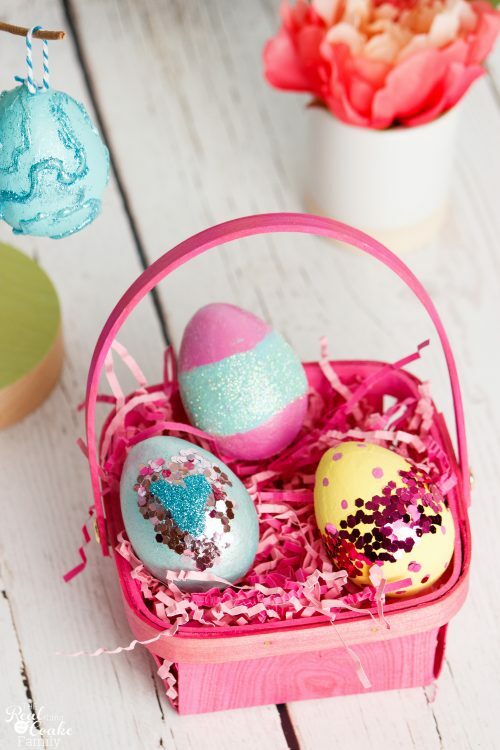 😉 Anyway, my girls and I had some fun with some Easter crafts for kids a week or so ago and I'm excited to share our fun ideas with you today. Aren't these just the cutest? 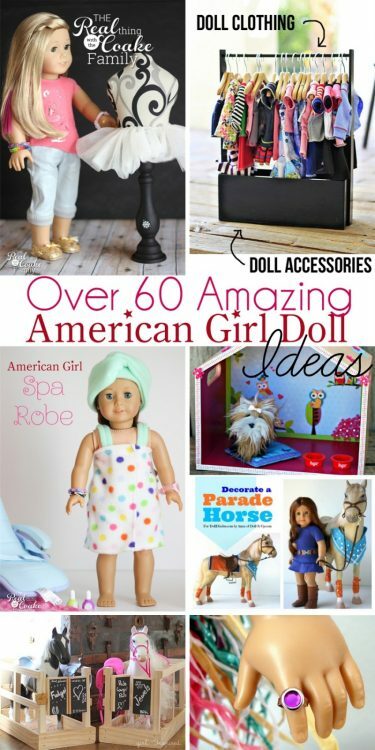 I've been having fun asking my girls about my crafty ideas and finding out if they are something they would like to do together. 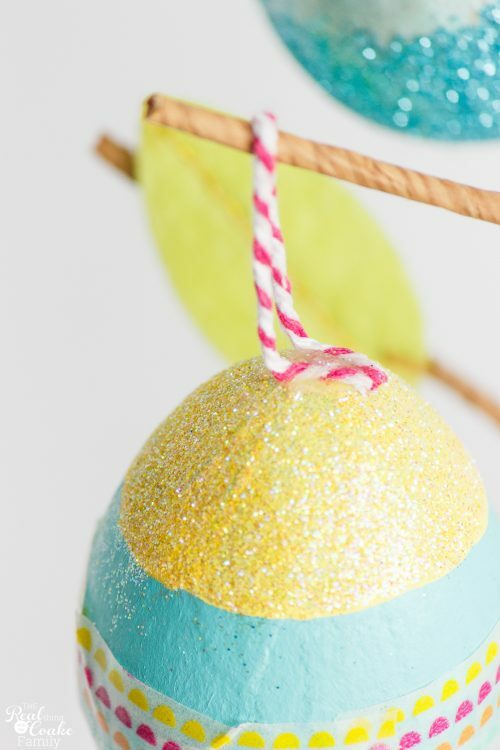 We had so much fun making the ornaments together at Christmas that I wanted to do something like that for Easter. We always have fun dyeing Easter eggs together and usually want more eggs even though we dye about 3 dozen. That was how fun making the ornaments at Christmas turned out to be, so I looked on Amazon and found some paper mache eggs (affilaite link) for us to decorate. I ordered them back in January, planning ahead. Yay for me! 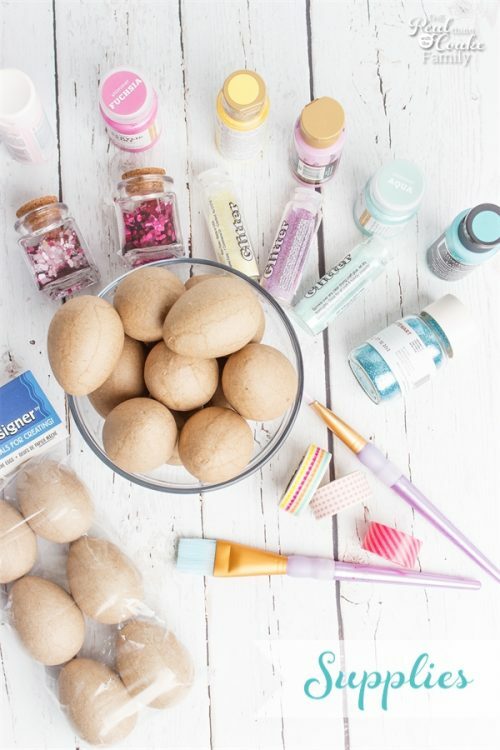 What is funny is that I'm seeing paper mache and wooden eggs everywhere now. 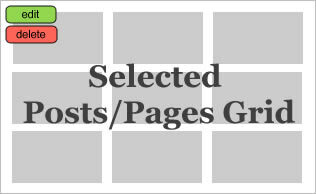 I don't remember seeing this many in years past, but maybe I just wasn't looking for them…or maybe I'm onto genius idea that others had as well. 🙂 Anyway, you can order them from Amazon or check Target's dollar spot because I saw some there and in their Easter section. So as things go with family and life, it turns out the day we decided to decorate our eggs, I had one cranky husband who was making everyone else cranky as well. Thankfully, I had one child who was ready to go and ready for fun any which way. Yay! My other daughter wasn't in the best of moods and spent a lot of the time painting her nails (with paint) rather than decorating eggs. By the end of our time together, we were all enjoying spending time together and being creative, but it took a bit this time. It isn't that this wasn't a fun activity, but rather it was just one of those days. You know what I mean, right? 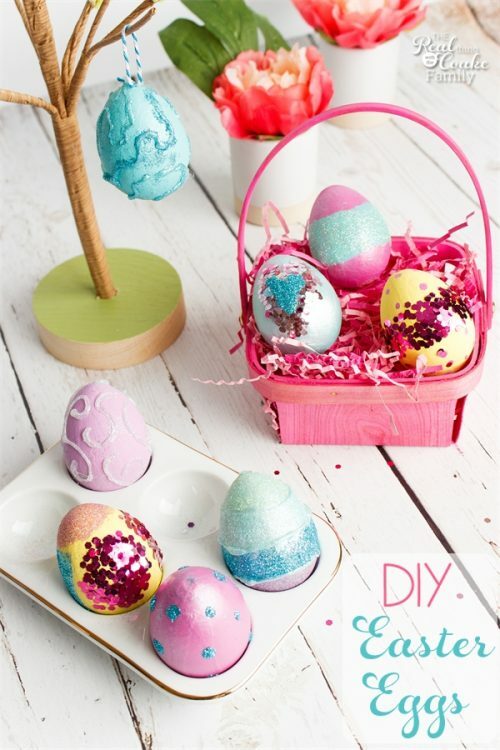 So, now that you know the real story, let me show you a few of the crafts for kids we came up with using the eggs. 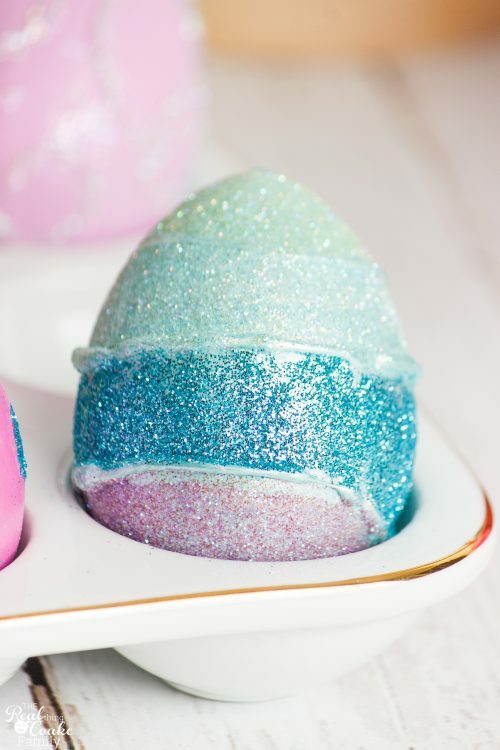 We found that it was best to paint a base coat on the egg of any color that you want the egg to have before you add any glitter or washi tape. 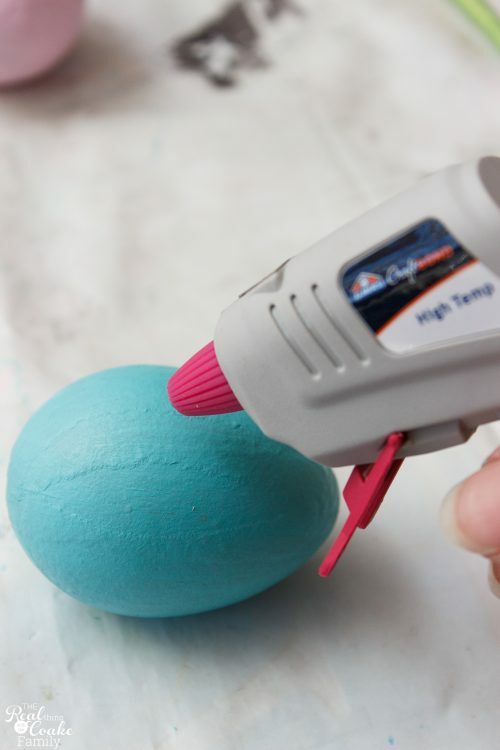 After allowing the base coat of paint to dry, use your hot glue gun to add a design to your egg. Allow the glue to dry. After the hot glue has dried, you can paint over it. In the case of this egg, I decided to add multi color stripes like I often do with dyeing Easter eggs. Once that was dry, I added glitter in coordinating colors. To add the glitter, just use a bit of Mod Podge on the area where you want glitter. Then sprinkle the glitter over the area. I love this look! I also tried using the hot glue gun in swirly patterns on the top purple egg you can see above. I was going to paint the glue and then glitter it, but I decided to just add a little Mod Podge to the glue (after it was dry) and sprinkle the swirly designs with glitter. 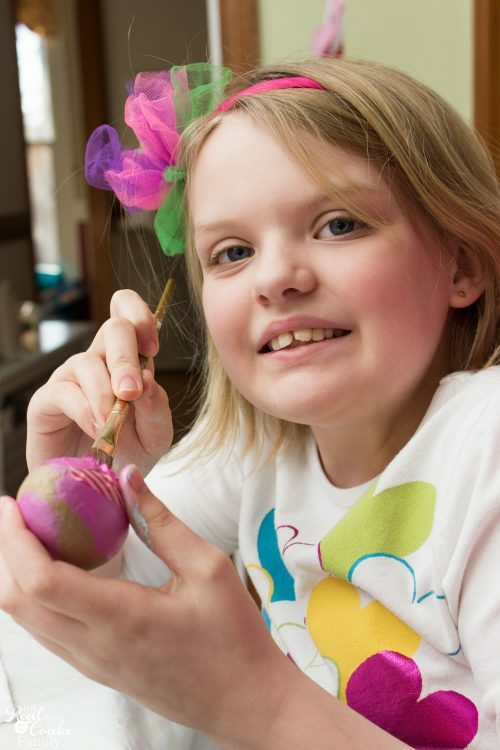 I also used the end of a paintbrush to put polka dots of Mod Podge onto an egg. Then I was able to sprinkle glitter on the polka dots. Cuteness! My girls had fun creating stripes of paint and adding glitter. There were some polka dots and a cute heart as well. 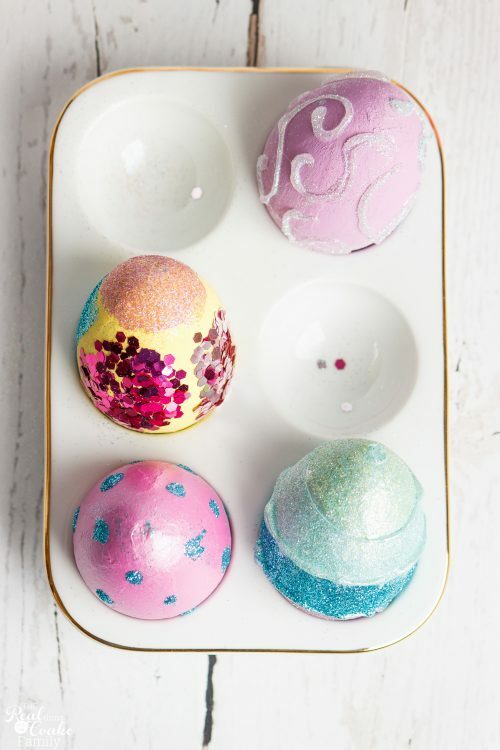 Much like the ornaments we did at Christmas, there are endless ideas you could do with the eggs. It was fun spending time with my girls and doing something creative….even if we all were a little cranky to begin with. 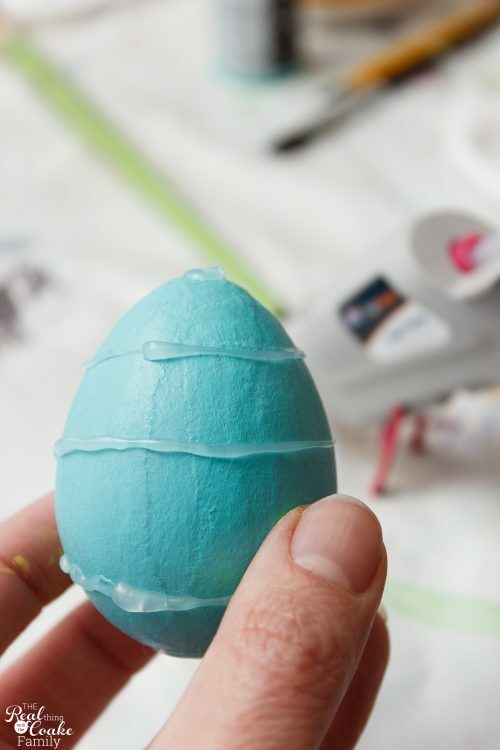 As far as where we will use the eggs, I added a hanger to some of the eggs, by adding a dab of hot glue and pressing a short piece of twine into the egg. I did that at the top of the egg. 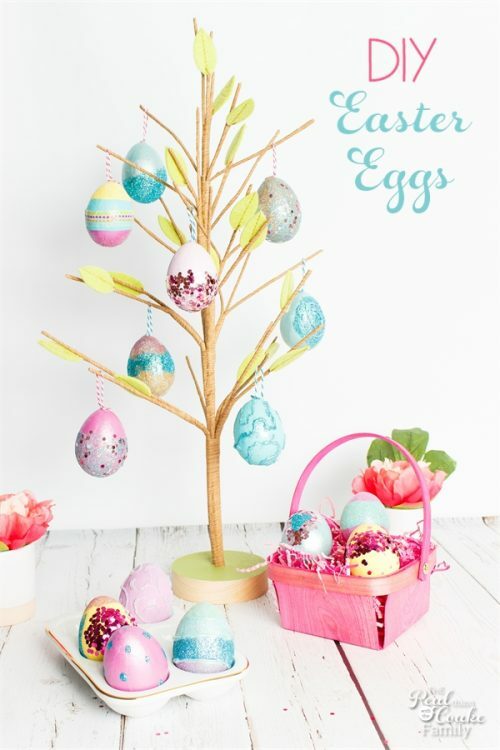 I could then hang them from the cute new egg tree I got at Target (affiliate link). I also may add more ‘hanger's to more of the eggs and use them on my mantel in a garland, much like the garland I made a few years ago…only with eggs we made. Cuteness! I love finding simple creative things to do with my girls. It is a good time to chill and be together without TV or electronics. These turned out so cute and despite our rough beginning, we enjoyed our time together. 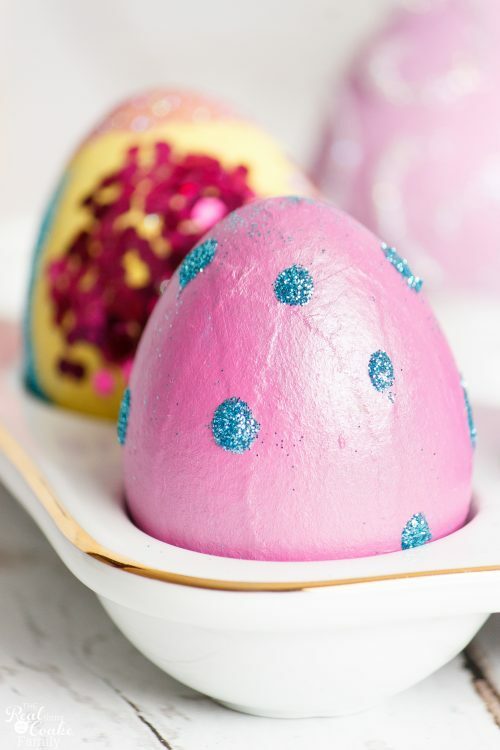 I feel confident that you and your family will enjoy these as well, especially if you like dyeing Easter eggs together or if you gave our ornament idea a try and enjoyed it. Do you follow me on Instagram? You should! I love IG and share all kinds of other ideas and inspiration that I can't share here. 🙂 Can't wait to see you over there! Such a fun activity to do with kids! I love how one of your girls wasn’t into it and painted her nails instead. So glad you were able to spent time together. This looks like so much fun! My kids would love to decorate eggs like this. Pinned! Thanks! We did enjoy it. I hope if you and your kids give it a try, you guys have tons of fun! These are SO CUTE! I love this! Pinning for later! I found you at the SITS Sharefest! Thanks! Have fun with them!